Welcome to the HikaShop demo website, where you will be able to test all HikaShop, HikaMarket and HikaSerial features, both on the FRONT-END and on the BACK-END. First of all, please note that the demo website is reset every few hours in order to avoid any misuse. While the reset process is running, you might be unable to access the demo website or see unexpected errors. In such cases, please try again a few minutes later. Also, please note that for security reasons, the demo website files and folders are not writable so some features, like uploading images, will fail on this website. You can see several HikaShop MODULES on the left of this page : the currency switcher, the cart module, the wishlist module and the categories listing module. 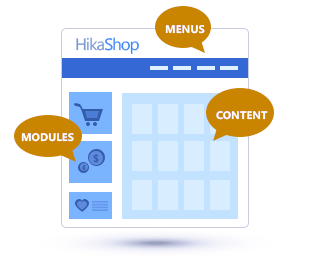 All these modules are automatically installed with HikaShop, and you will be able to customize your modules with a lot of options as well as CSS in order to fit to your website. On the top menu, you will see several HikaShop MENUS that display the "Categories listing", the "Products listing", "Product's page" and lots of other menus which will present different aspects of our products. We've filled this demo website with default data (products, users, orders, discounts...) and chose to display them with different layouts so that you can see examples of many features and configurations available in our components. Basically, in the CONTENT area, you'll see the fake online store we created so that you can demo our products all you want ! Then, if you add a product to the cart, you will be able to test the checkout process and proceed until the end of the order confirmation. Also, you will be able to access the user control panel where you will be able to manage your profile and your orders. We realized this demo website with Joomla 3.x, our extensions and the JoomlaShine Joomla template named : "JSN Glass Pro". You can personalize HikaShop as you want thanks to styling options in our extensions and CSS, or by using a template optimized for our ecommerce solution. We invite you to take a look at some of the Joomla templates out there, specially designed for HikaShop on our templates page. (with a link going to the corresponding documentation). (with a link to a page of our demo website where you can see an example). 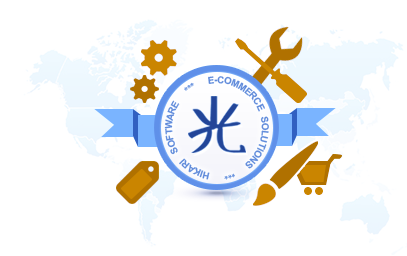 You can access all configuration's options of HikaShop, HikaMarket and HikaSerial through the back-end of this demo website. There, you will be able to manage your products, categories, customers, sales, zones, tax rules, currencies, discounts, coupons, order statuses, payment plugins, shipping plugins, banners, partners but also customize the views, emails, translations (these last 3 won't work on this demo website since the files are not writable), content modules, content menus, fields, filters, and visualize the statistics, etc. All your modifications and tests will have a real impact on the front-end, so that you can see exactly how our components work. * If you break something, no worries, this demo website is prepared for this and is reset every few hours. BACK-END . 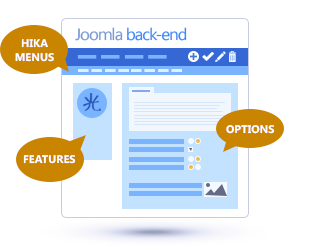 Each time you'll see this button you can click on it to be redirected directly to the back-end and see where exactly you can configure our products in order to get the result that we present.